Ever fantasised about hijacking the Tardis and going back in time to bag books that were going for pennies or a shilling ( or even gratis ) and returning to a UK in recession and selling them for tens or hundreds of thousands ? Of course you have. Mind you, you’d have to deal in the correct currency, but a few visits to auctions houses or coin dealers might solve the problem. But do take a stout bag (perhaps a large backpack) and plenty of cash. Shelley’s Revolt of Islam (1818) 6d. In 1822, following Shelley’s death, wily old atheist Richard Carlile somehow managed to bag around 180 sheets of the privately printed poem, the author having already given away about 70 bound copies to friends. Ideally, you would need to get there before Carlile, but if you were too late, the radical rascal might do a deal. Fresh out of jail, he would need the money. If you bagged the lot for £5, you might struggle to carry the sheets back home to 2012, but it would be worth it. Harrington has a association copy for £14,500, but even if you consigned ordinary copies ten times a year to auction houses in various parts of the world over a period of ,say, eighteen years, you’d end up (after paying commission) with around £1.5m profit ! 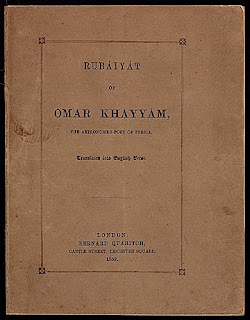 Shelley’s Revolt of Islam, which was published at the poet’s own expense in an edition of 750, did so badly in 1818 that in 1829 the family ( Shelley’s widow or pater, Sir Timothy ) sold the unbound sheets to pirate bookseller John Brooks, in bundles of 25 for sixpence a copy. Brooks then sold them in his bookshop for half a crown (12 1/2p). You could do much better than Brooks in 2012. Actually, over £100, 000 better. 2) Keats’ Endymion (1818). A penny halfpenny. Publishers Taylor and Hessey were so alarmed at sales that they sold the remaining sheets of Keats’ long poem to a bookseller /waste paper merchant called Edward Stibbs for a penny halfpenny (half a pee) a copy. This Stibbs character then paid a jobbing bookbinder tuppence halfpenny ( 1p) to bind some sheets and the resulting bound volumes were sold in Stibbs’s Strand bookshop for 1s 6d. History doesn’t record exactly how many sets of sheets were bound or what happened to those that weren’t. Had you landed in the London of the original Tom and Jerry in 1821 doubtless you could have found Stibbs’s shop and done a deal with him for all the sheets over a jug of ale and a visit to The Fives Court to see Bill Neat box . But whatever you do, don’t mention that a copy of a bound Endymion in 2012 would fetch a cool £6,000 ! 3) A ticket for Shillibeer’s Omnibus (1829). One (old) penny upwards. It’s not worth the risk of drowning to snaffle a Titanic menu, but land in 1829 instead and while you’re buying the unsold sheets of son Percy’s Revolt of Islam for a bargain while also checking out Mr Peel’s new-fangled ‘bobbies’, you could make your way to the New Road and try collecting some used bus tickets from the floors of Mr George Shillibeer’s new patent Omnibus. The earliest ‘bus tickets ever issued in the UK rarely, if ever, appear on the market, but when they do they generally make more than a £100. Just think of how many you could cram into your bag. 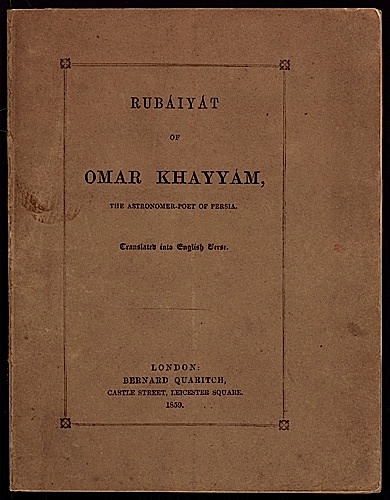 4) Edward Fitzgerald’s Rubaiyiat of Omar Khayyam (1859) 1d or 2d. Whizz back to the year 1861 and make your way to the Castle Street bookshop of Bernard Quaritch, where in the bargain box you’d find priced either at one, two or four old pennies, many copies of the remaining stock of young Mr Fitzgerald’s translation of the Persian classic, which had found no buyers at the original 1859 price of one shilling. Grab as many as you can, and in case scholar Whitley Scott and some of his literary cronies, haven’t bought their own copies, leave some in the box for them to discover. Even if you only managed to buy 50 copies, at the 2012 price of around £28,000each, those slim volumes would be worth around £1.5 m today. 5) Catalogue of Manet and the Post impressionists (1910) One shilling at the door. Programme the Tardis to land off Bond Street on or about 8 November 1910. Here you will find the Grafton Galleries, where an exhibition of poncy foreign ‘ artists ‘, most of whom couldn’t even draw properly, should be worth a look. While you’re there buy twenty or more catalogues at a shilling a pop. Roger Fry might be on the till and you could possibly bump into Virginia or Lytton. Even without illustrations, copies of the catalogue now sell for well over £1,000, so that’s a cool £20,000 profit. Now that’s what I call ‘making an impression ‘. Many thanks Robin. A fascinating game, but don't forget the 'Diamond as big as the Ritz' factor - with so many duplicates of these items the market would flatten unless you teased them out over a decade or two... the best move at the Post Impressionists would be to swan around with your catalogue, buy £1000 worth of pics, about a dozen (they were on sale) concentrating on heavy hitters like Van Gogh and Cezanne, load them into a Tardis Transit Van parked around the corner in Haunch of Venison Yard, come back to now and bang them in auction and then look for your name on the Sunday Times list (£1.2 Billion). You could keep the catalogue as a memento -the money, as always is in the art. 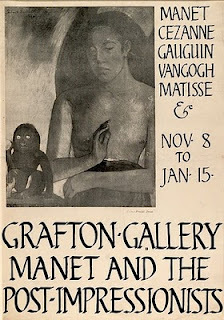 More money to be made at the 1910 by buying the odd Gauguin or Van Gogh, don't you think? Anything taken back to the present day would look suspiciously fresh, and would fail carbon dating tests. The only way to ensure their natural ageing would be to hide them somewhere and hope they remain untouched. What would be a good place to hide books/ephemera for a few hundred years? 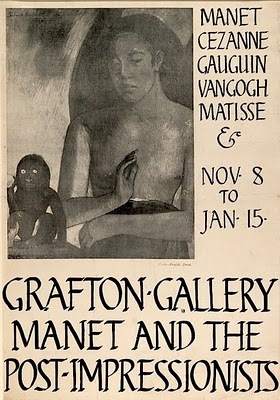 I believe that most of the paintings on display at the Grafton Gallery were not for sale. Those that were for sale could, I suppose, be bought for a few guineas, but remember, you'd have to hand over the right kind of pound note, sovereign or whatever. Also, just think of the puzzlement and suspicion produced by paying for the picture with very worn crowns, florins and shillings dated 1908 !! And if coins weren't worn at all, you might be arrested for forgery.